We’ve added seven more pieces to the installation I curated with Mr. Webster for his showroom, Webster & Company, at the Boston Design Center. All abstracts in shades of black, white, and grey, by artists with distinct styles. The first four are by Betty Carroll Fuller, whose work I first saw on the Outer Cape. An art professor at Cape Cod Community College, Fuller’s work presents abstract forms, lines, and layers of color that are simple and spare, but not spartan. The next abstract painting is by Jen Kelly, a Hingham-based artist who studied art at Boston College and has a master’s in social work. Kelly paints abstracts and landscapes while combining the arts with social causes. The third is Jen Bradley, who my friend Stephanie Walker of Waitsfield, Vermont gallery Walker Contemporary brought to the mix. Bradley is a Boston-born artist who earned a B.F.A at MassArt and teaches at South Shore Art Center, paint, screen-printing, glazes, and drawing in her abstract works. Webster & Company is hosting an opening this Tuesday, Nov. 10, 6pm-8pm at the showroom at the Boston Design Center. Please let me know if you’d like to attend. Next week I’ll post some installation shots in the Webster & Company showroom. Tagged as Betty Carroll Fuller, Boston artists, Cape Cod artists, Jen Bradley, Jen Kelly, New England artists, paintings, Webster & Co.
I’ve since met Sarah Lutz on the Cape, where she spends summers, and have been tempted by her pieces at Truro Center for the Arts at Castle Hill. Her current exhibition Tales from the Garden . 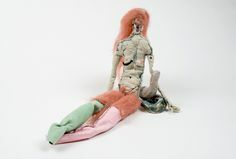 . . And Other Mythologies is currently on display the Mercy Gallery at the Loomis Chaffee School, where Lutz is an alum. The scale of the pieces is much larger, thanks to the freedom she found in her new, larger studio. Here is a mix of work Sarah Lutz’s show at Loomis Chaffee, as well as the marine-inspired art of hers displayed in my living room. Surge Series 1o on the shelf in my living room. Friday night we went to the opening of a group show at the Berta Walker Gallery in Provincetown. My mother-in-law, Judyth Honeycutt Katz, had 11 pieces hanging in the show. Like last year, they hung alongside some of the best artists in Provincetown— Robert Henry, Salvatore Del Deo and Romolo Del Deo. Berta Walker represents some of the best known artists on the Outer Cape, including Paul Resika, Selina Trieff, and Elspeth Halvorsen, Penelope Jencks, Sky Power, and Varujan Boghosian. She always has a few treasures by Hans Hoffman too. The exhibition runs through August 11, so stop by if you’re in Provincetown. This is Judy’s second show; I blogged about the Berta Walker opening last year here. Judy has masses of amazing work. I should dig through her studio. I spent the last week sleeping in the same building, but alas I was too busy being on vacation. Here are a few photos I took last year, of her pieces that hang in my apartment and her own house. This large wild landscape hangs in my living room in Boston. Judy just gave this one to my husband to hang at the office. This is my in-law’s living room on the Cape. I think all three paintings are from a trip to the Southwest. Better shots of each below. The next two are hanging in their house in Connecticut. I think they were done during an excursion to Alaska.